Since many grocery stores are open 24 hours a day, take advantage of it! Avoid shopping on weekdays during the peak hours of 11am-1pm or 5pm-7pm (all stores are different so ask your sales clerk for your store’s peak hours). 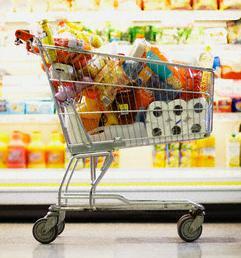 With less people to navigate around and shorter lines, you can cut your shopping time in half! If you have plenty of storage space in your pantry, stockpile when deals are hot… but only do so if you can keep a regular inventory of what you have. If you can always keep a backup supply of products such as paper goods, soaps, cereals, crackers, and canned foods, you’ll save time by not running back to the store for that one necessary item that you forgot to buy. To take it one step further, put your groceries through the checkout in categories and ask the courtesy clerk to bag them that way. Group together all freezer items, fridge items, pantry items, fruit, and household products. When you get home you can put them away quickly because it’s already sorted. And the one tip that you’ve heard a million times… make a list and stick to it! It’s ok to quickly glance “just in case” you forgot to put something on the list, but don’t spend too much time perusing.